You may place your order online, or by phone. Online ordering is safe and simple. Just select your options and send your photos. You may call toll-free 1-877-390-5568 to place an order by phone. How do I mail traditional prints, negatives, slides or CD's? Choose the "postal mail" option when ordering your canvas. We will rush a prepaid mailing envelope for your return. If your print is larger than 5 x 7 or you are sending a CD, please indicate. What happens to original items that are mailed to you? Great care is taken with your original prints and they are always returned with your order. We accept JPG, TIFF and PSD files. If you are sending a PSD we recommend flattening the image before sending. In what color space should I save my file? Should I enlarge or reduce my file before sending? This is not recommended. When possible, send your file in its original size. Any enlarging is best left to us. May I scan my own photo? Yes. 4" x 6" prints scanned at 600 dpi will enlarge to any size. Be sure to crop away the surrounding blank areas before scanning. 8" x 10" prints can be scanned at 300 dpi for any enlargement. Do you review images before you print? Yes. 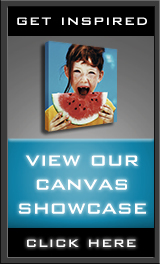 Our goal is to create the finest canvas print possible for our customers. Every image is professionally evaluated before printing. You will be contacted promptly with any questions or concerns. How will I know if the size and quality of my photo is good enough for a canvas enlargement? Most digital images captured with a fairly new camera will be large enough for any size. Generally speaking, a 1.0 MB file is large enough for any canvas print. If you are concerned about the enlargement capabilities of your file, please feel free to send them to us prior to placing your order. Our abilities to enlarge your files are extensive and we are always happy to take a look and answer any questions you may have. How will I know if my image uploaded successfully? The uploader on the ordering page accepts .jpg files or .jpeg. Your photo will appear when your image has been uploaded. If you have any other type of file please use our basic uploader. You can find a link to the basic uploader just above the uploader on the ordering page. Large files may take a while so please be patient. Can I have my image reviewed prior to ordering? No problem. We are always happy to assist you. Simply send your image along with any questions and concerns, or call, and we will review your image and let you know about the end result. Will I receive a proof of my photo before you print? After you have placed an order, we will be happy to send a proof via e-mail to address your specific concerns, or when we need your approval when unusual circumstances occur. Sending proofs before printing is not standard procedure and generally speaking, is not necessary. What if my photo has been taken by a professional? Please refer to the terms and conditions section of our info page. All orders are shipped out via FedEx Ground in 3 to 5 business days from reciept of your order. Depending on your location, you should allow 1 to 4 business days for delivery to your door step. We ship via FedEx Ground and charge a flat rate of $9.99 per order plus $2.99 per additonal canvas regardless of the size of canvases. The more you order at one time, the more you will save. Rush shipping is also available, please call us at 1.877.390.5568 or use our contact form for a rush shipping quote. Please note: Our flat rate shipping method may not be available with volume discounts, trade discounts ect. Standard orders ship in approximately 3 to 5 business days. Orders received after 3:00pm central time will usually be processed the following day. Large quantity orders, or orders placed during high volume seasons may take longer. We are located in central Texas, your order will take anywhere from 1 to 4 days to arrive depending on your proximity. SPECIAL NOTE: If you have a specific deadline for delivery, please let us know when placing your order so we may make adjustments in scheduling so we can try to avoid rush shipping costs. I have a special request or concern and need advice. Can I speak to a representative? We are always happy to assist you. You may fill out our contact form or call our toll-free number 1-877-390-5568 and one of our customer service representatives are there to help. Will my canvas scratch or fade? All prints are finished with a protective coating. This will reduce scratching and fading. You may clean with a soft cloth and it is not advised to hang in constant direct sunlight. Do you include hardware for hanging my canvas? Canvas prints display best when they fit flat against the wall and it has been our experience that 2 evenly spaced nails or anchored screws placed in your wall works best. We will include hanging hardware Upon special request, however, keep in mind that there are different hanging conditions and Imagine Canvas does not guarantee hanging hardware or damage resulting from its installation or use. Yes, please refer to our guarantee page for more details.